From January 12th to 14th 1996, about 120 active and ex-Amiga-users, many of them regularly also present on IRC at #amigager, held another of their (more or less) famous meetings. The Meeting was the third one in Karlruhe, and it took place at the Fachhochschule there. 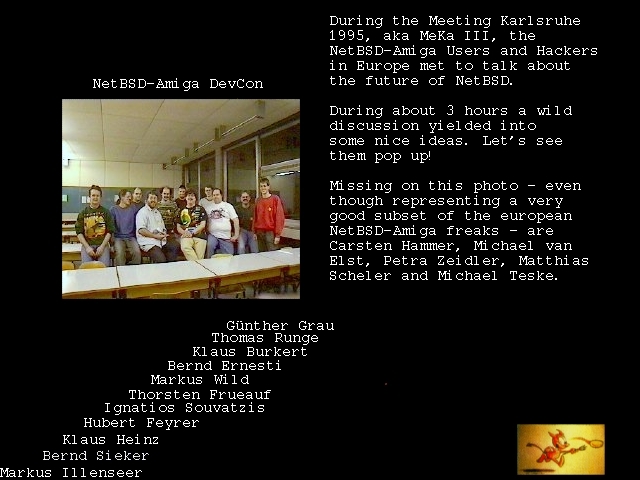 Participants came mostly from Germany, and among them were some of the people, who made the Amiga-port of NetBSD what it is today. The maintainer of the amiga-port, Chris Hopps, is short on time, and therefore some support from a second person with (write) access to the Amiga-part of the NetBSD-CVS-tree would be a Nice Thing to have. As a result of a long discussion, Ignatios Souvatzis offered to aid Chris by working on the integration of small isolated change requests and bugfixes so Chris can concentrate on the important work. It was also suggested to share the responsibility for different things (graphics, networking devices, or device drivers in general) between several people, so not everyone has to care about everything. Chris has yet to be mailed to see if the help offered is wanted. From the Amiga-people on the meeting, a Amiga has been kept online for more than two years now. For quite some time, this has been dusk.rz.uni-regensburg.de (A2000 owned by Hubert Feyrer), right now it's grizu.fh-regensburg.de (A3000 owned by Ingo Reckziegel), but the latter will probably go away in the not so far future. Markus Illenseer suggested that we should try to keep an Amiga running NetBSD on the Net somewhere, to provide a machine where developers can look up things and test non-critical things (i.e. things that won't crash the machine :-). The machine would also be used to compile packages that would be offered for FTP from ftp.uni-regensburg.de then, providing ready-to-install binaries for NetBSD/amiga (and probably most other m68k-platforms). To offer such a service, the machine would run only official NetBSD releases, not -current. Markus Illenseer commited himself to ask Amiga Technologies and Village Tronic for Hardware-support. Ignatios Souvatzis is currently working on porting Michael Hitch's fastmem-loader and NetBSD/amiga itself to the DraCo mainboard and the M68060 CPU. Ready-to-install binaries from ftp.uni-regensburg.de for NetBSD/amiga. From the marketing point, Gateway! Vol. 2 will most probably be sold similar to the "Meeting Pearls" CDs, which come from former Amiga-meetings and will be continued in the future. This means, the CD's itself will be as low as possible and won't include any money for the maker, but rather only contain a form for a money order to your bank, so anyone who likes the CD can donate some money. The money will be used for NetBSD in some sort then. Markus has also an offer from O'Reilly to produce a NetBSD-CD. This CD would be targetted to the i386-port mostly, but probably contain binaries for amiga and sparc, too. This is only an offer, and no commits have been made so far. The amiga-port's lacking up-to-date documentation. Several FAQs and lists have been written, but aren't maintained any longer. To do a little bit against this, the NetBSD/amiga FAQ will be updated by Hubert Feyrer occasionally. Markus Illenseer's X-FAQ and Hubert Feyrer's Networking-FAQ both need updating, but none of them has the time for it right now. Volunteers for documentation would be very welcome! The main mediums for discussion among NetBSD users right now are the mailing lists at netbsd.org, and some Newsgroups (comp.unix.bsd.netbsd.announce, comp.unix.bsd.netbsd.misc). Both are in english language, and so far, no discussion forum for german (language) users is known to exist. Furthermore, a coordination of all german or even european NetBSD-users (not only the Amiga ones) would probably make sense, but no decisions have been made here. Several weeks ago, FreeBSD opened some servers in Germany, in the domain de.freebsd.org. If a reasonably large user community could be gathered (all ports, not just Amiga! ), it might make sense to open a similar subdomain, providing faster access for FTP, WWW, SUP and maybe even CVS. Esp. the CVS would probably demand a bigger care & effort to implement, but noone was able to answer that question for sure. It's also questionable whether it's worth at all, as it's not known how many of the people with access to the CVS-tree would benefit from that. Furthermore, no hardware is available for offering such a service, as well as the network connectivity. No conclusion was made on this suggestion.